This guide explains what to do if you have received a Court Attendance Notice for a criminal offence and have to go to a NSW Local Court. It can take time to organise to get advice from Legal Aid NSW or from a private lawyer or from a Community Legal Centre or the Aboriginal Legal Service. If you prefer to speak for yourself in court, it is still important to get legal advice before your day in court. Remember the court will be making decisions about your future. So getting legal help is a good idea! 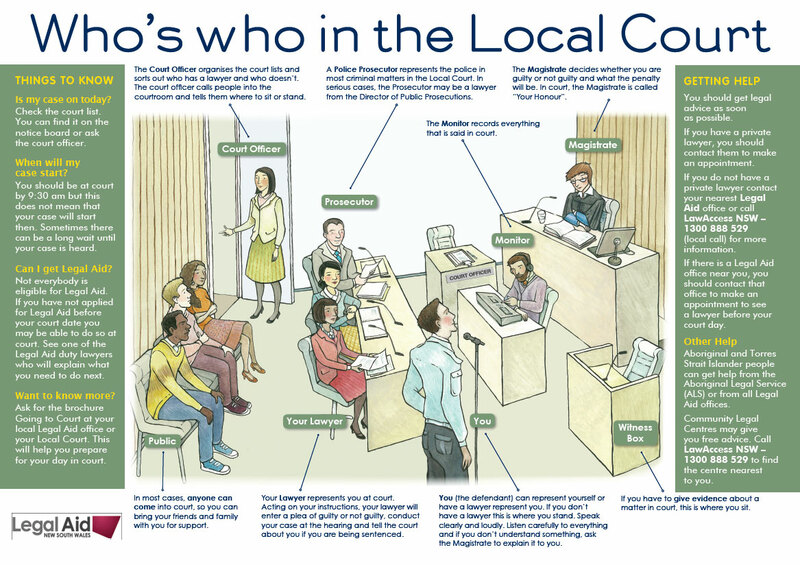 Ring the Local Court where your case is to be heard and ask them to book an interpreter in your language. If you are seeking advice or representation from Legal Aid NSW, the Legal Aid office can arrange an interpreter for your appointment with a lawyer. Remember to take all your police and court papers with you to any appointments with a lawyer. LawAccess NSW is a free government telephone service that provides legal information, referrals and, in some cases, advice for people who have a legal problem in NSW. Call them on 1300 888 529. Legal Aid NSW also provides free legal advice to anyone on most matters. Legal representation is available for some matters to people who meet our eligibility tests. To contact Legal Aid NSW, ring your nearest office to make an appointment. When you attend your appointment take your court papers and some documents showing your income and assets. If you are eligible for legal aid, a duty lawyer will represent you. Private Lawyers If you wish to have a private lawyer represent you in a criminal matter in the Local Court, you can contact the Law Society of NSW on 9926 0300 or check the website at www.lawsociety.com.au to obtain the names of private lawyers nearest to you. Fees for private lawyers vary, so make sure you discuss the costs at your first interview. The Aboriginal Legal Service (ALS) can help you if you are Aboriginal or a Torres Strait Islander. Ring your nearest ALS office for more information. Details of these services are outlined below. The court date and the address of the court that you MUST attend are detailed on your Court Attendance Notice or bail form. Make sure you come to the Local Court on this day. If you are unable to attend court for a very good reason you should telephone the court and tell them what the problem is. They will tell you what you should do. If you are sick you should provide a medical certificate. Ask your doctor to write on the certificate why you are not able to go to court. You should fax this certificate to the court before the matter is due to be heard. Warning: If you don’t turn up at court, and you are required to do so, your case might be decided without you and/or a warrant for your arrest may be issued. When you arrive at the Court House, Sheriff’s officers may conduct security searches in order to protect public safety. You can help reduce delays caused by security checks by thinking about the items you carry. Some of the things you won’t be allowed to take into court are knives (any type), scissors, spray cans, tools, studded belts, syringes and motorcycle helmets. Anything that could pose a risk to public safety will be taken away from you while you are in court and may be returned to you when you leave. If you have anything illegal, for example a knife, police may be contacted. Mobile phones are allowed in court but they must be silenced and you must not use their camera or audio recording capabilities without the court's permission. Put together all the papers you have been given about the case such as police facts sheet, Court Attendance Notice and bail undertaking. You will need to bring them with you to court. You should makes notes in your own words about what occurred relating to your charge. This should include any conversations with police and witnesses. Make sure you do this while the events are fresh in your mind. This is a very important practical step you can take to prepare for your court appearance. Important: If you have not been placed on bail to attend court, you may be able to plead guilty to the charges listed in your Court Attendance Notice without going to the Local Court in NSW. Carefully read the information that comes with your Court Attendance Notice. If you have been given a Written Notice of Pleading you may be able to fill it in and send it back to court, instead of going there personally. If you want to plead Not Guilty, fill in the form carefully. The court will give you a hearing date. You will have to attend court for the hearing. If you agree that you are Guilty, you may wish to write a letter explaining why you committed the offence and send it with the Written Notice of Pleading. Sometimes the court will decide not to finalise the matter without you being there and may write to you and tell you to attend court on another day. So if you change your address, or if you will be away from home, you must tell the court. You must check with the court, by telephone or by going in, to find out what decision the court made about your case. This is very important. For example, in a traffic case the court may disqualify you from driving a motor vehicle. If you are bailed to attend court and you do not go to court on the day required, you are in breach of bail. A warrant may be issued for your arrest. Money put up for bail by you or a family member may be forfeited. Most courts start at 9.30am. Many have a Registrar sitting from 9.30am to handle adjournments. Check your papers to see when you need to be there. You should get there before court starts. Cases are heard as soon as possible, but if the court is busy, there could be long delays. Be prepared to wait all day. Before you go into court make sure your turn off your mobile phone and remove any hat or sunglasses you may be wearing. The cases to be heard are on a court list. This is usually displayed in the foyer or near the court entrance. This list will tell you which courtroom you are in and give you a case number. If you can’t find your name on the list, ask the court officer to assist you. At some courts, there is a Registration Desk. Make sure you inform court staff that you are at court for your matter. They will then tell you what court your matter is in. When you enter a Courthouse look for signs that may direct you to a Registration Desk. What time is your case on? This depends on the number of cases in the Local Court on the day. You should wait inside the courtroom where your case is to be heard or near the court room where you will hear your name when it is called. A court officer will call your name when your case is ready to be heard. You should listen carefully for this and stay where you can hear your name called. If you go outside you may miss your name being called. You must tell the court officer you are present. If you are not sure where to stand when you enter the courtroom ask the court officer to show you. If you don’t hear your name called, ask the court officer to help you. Do you want legal aid? If you haven’t had any legal advice before the day or you want to apply for legal aid, look for the duty lawyer. If you can’t find the duty lawyer’s room, ask the court staff to show you. You will need to wait near the duty lawyer’s room until they can see you. At some courts the Legal Aid lawyer will not be able to see you that day. They will advise you to ask the Court to adjourn your matter to another day so you can get advice from Legal Aid NSW. Remember, duty lawyers are often very busy and may not be able to see you until later in the day. the type of punishment likely to be imposed by the court. You should contact the Legal Aid NSW office closest to the Court that you must attend before your court date. If you have a lawyer, the Magistrate will speak to you through your lawyer. If you do not have a lawyer the Magistrate will ask you a number of questions. When answering, you should address the Magistrate as “Your Honour”. Do you have a lawyer representing you? Do you wish to have your matter dealt with today? The Magistrate asks this question to see if you are ready to deal with your case or need an adjournment for an appropriate reason, eg to get legal advice. You would usually be given one adjournment if you ask for it. Are you pleading guilty or not guilty? The magistrate cannot give you advice about whether or not you should plead guilty. You need to decide this before you go to the court. In most cases if you plead not guilty, the Magistrate will order a 'brief of evidence' (also called a ‘brief’) to be served upon you, or your lawyer. The brief contains the evidence the police will rely on to prove their case. You will be given a date to come back to court after the brief has been served, to confirm you are still pleading not guilty. You will not be given a brief of evidence for some less serious matters, including most traffic matters. If you have been charged with a domestic violence offence the procedure is a bit different. You should get a copy of Legal Aid NSW's brochure Domestic Violence Offences - Information for defendants. If you have a lawyer, give them a copy of your brief of evidence and discuss it with them before you return to court. You should carefully read through the brief line by line and note anything you disagree with. Also write down your own version of what happened as soon as possible after it happened. When you attend court you will be expected to tell the court whether you will have a lawyer for the hearing and who the lawyer will be. You will also be asked how many witnesses you will be calling including yourself if you intend to give evdence. If you, or any of your witnesses, need an interpreter you should tell the court. You may also be asked to tell the court whether you want all of the police officers and any other witnesses to attend court or whether you would agree to some of the statements of witnesses being read by the magistrate without the witnesses coming to court. If you agree to a statement of a witness being given to the magistrate then you will not have the chance to ask the witness any questions and the Magistrate may accept the contents of the statement as being true. You must read the statements carefully and should get legal advice before answering these questions. You will then be given a date for hearing. You must make sure that your witnesses know what day your case is on. You should check whether any of your witnesses will need a subpoena to attend court. For example, if they need to take a day off work they may need a subpoena to show their employer. If you don’t have a lawyer you should ask the Registrar of the court about how to issue a subpoena. If you have been charged with a very serious offence it may not be finalised in the Local Court. You may have to go to the District or Supreme Court. You should get a copy of Legal Aid NSW’s brochure Are you facing a Committal? If you want a lawyer to represent you at a hearing you must arrange it as soon as possible (legal aid will not be granted if you apply for legal aid less than 14 days before the hearing date). The police will present their case first. They will call their witnesses to give evidence, for example the police officer in charge of your case (also sometimes called the 'OIC') and any other witnesses. After each witness gives evidence, you or your lawyer have the right to cross-examine (question) them about their evidence or about other matters relevant to your case. After the prosecutor has called all of their witnesses you are entitled to give evidence (if you want to) and to call witnesses. Generally, if you choose to give evidence,you would be the first defence witness to give evidence. The prosecutor is likely to cross-examine (question) you. Then you can call your witnesses. After each one gives evidence the prosecutor can cross-examine them. Each witness must wait outside the court room until it is their turn to give evidence. Make sure your witnesses are at court on the day of the hearing to give evidence in person. After all witnesses have given evidence the prosecutor may make submissions to the magistrate about why you should be found guilty of the offence. You can then make submissions, that is, tell the court why you should be found "not guilty" based on the evidence. You have been found guilty. If this happens the Magistrate will then consider the penalty. In most cases, if you plead guilty, the Police Facts Sheet, which is the police version of events, will be read by the Magistrate. You should read it before the court case. If you agree that you are guilty of the offence but disagree with some of the things said in the Facts Sheet you should ask to speak to the prosecutor. It may be possible to agree to some minor changes with the prosecutor. If you cannot reach an agreement with the prosecutor about what the Facts Sheet should say, you may have to have a hearing about the parts of the facts you disagree with instead of using a Facts Sheet at all. As with other hearings, both sides call witnesses so that the Magistrate can hear their evidence before deciding what facts are proved. The Magistrate may also be given other documents, for example statements from any witnesses, photos, your record of interview and a copy of your criminal record if you have one. You may object to any of these things being given to the court, for instance because they are unfair - but be prepared to explain why you object. You may also give the Magistrate some documents, for example a statement by you about your circumstances and why the offence happened or character references. You (if you are representing yourself) or your lawyer will then give an explanation about how and why the offence(s) happened and some information about yourself, your current financial situation, personal circumstances and general character. It is particularly important to tell the court if you are sorry and about any rehabilitation you have undertaken, for example drug or alcohol counselling, domestic violence programs, the traffic offenders’ program. If possible bring a letter from the counsellor or program coordinator about your attendance and any medical documents about your general health (including mental health). The Magistrate will then consider the penalty. Penalties range from dismissal without conviction through to conviction with a fine, good behaviour bond, community service order, suspended sentence, intensive correction order, home detention or full time gaol. If you think that you may be facing a gaol sentence, it would be a very good idea to get legal advice as soon as possible. If the Magistrate is considering a serious penalty or wants further information, you may be referred to the Probation and Parole Service to get a presentence report (PSR). This report tells the court about you and what sort of penalties are suitable for you. Some Local Courts have a duty officer from Probation and Parole and this report can be prepared the same day. When there is no duty officer, or if a more detailed report is needed, your case will be adjourned for several weeks so the report can be prepared. You must keep your appointment with the Probation and Parole Service. If you don’t keep your appointment, this will be reported to the Court. Once the Magistrate has decided on the penalty in your case, make sure you understand what it is. If you don’t have a lawyer, ask the Magistrate or court staff to explain the penalty to you. Sometimes if the offence is very minor and you have previously been of good character the Magistrate may decide not to record a conviction or give you a penalty. This is referred to as a Section 10 dismissal. Fines are often given for less serious offences. If you receive a fine, there will be a set time to pay, usually 28 days. If you cannot pay within the set time, you can make an application to pay by instalments. Go and speak to the court staff before you leave. If you do not pay the fine within the time set, the State Debt Recovery (SDR) can impose a range of penalties against you such as suspending your driver’s licence and imposing additional enforcement fees. If the SDR takes action against you and you still cannot pay the fine or you need more information you should ring the SDR Fineline on 1300 655 805. If you are unable to pay the fine, you may be able to apply for a Work and Development Order (WDO). You may be eligible for a WDO if you are on a Centrelink benefit, if you are homeless, have an intellectual disability, mental illness, cognitive impairment or serious addiction problem. If you are eligible you can clear debt by working or attending counselling, rehabilitation or education or by getting treatment you need. For more information call LawAccess NSW on 1300 888 529 or the SDR's WDO Hotline on 1300 47 88 79. A bond is an agreement by you to be of good behaviour, that means not committing any more offences. The magistrate may also impose other conditions, for example attending drug and alcohol counselling or anger management courses. If you have been given a bond it is very important that you understand what you have to do. The magistrate will tell you in court what the conditions are. They will be written on the bond by the court staff. You must sign the bond. Make sure you understand the conditions of the bond. Check with your lawyer or the court staff if you are not sure about anything. If you break your bond either by committing another offence or by not complying with any of the conditions, you can be brought back to court. Unless there was a very good reason for breaking the bond, the Magistrate will resentence you. This means giving you another penalty for the offence. Usually that means getting a more severe penalty. Suspended sentences should be taken very seriously. If you have been given a suspended sentence it means that the Magistrate thought that a gaol sentence was appropriate for you but that there were good reasons not to send you to gaol straight away. If you are given a suspended sentence you will be placed on a bond, called a section 12 bond. You may have conditions attached to your bond. If you break your suspended sentence, either by committing another offence or by not complying with any of the conditions it is very likely that you will go to gaol. Other penalties, such as community service orders, intensive correction orders and home detention, are possible penalties for serious matters. Generally you would have spoken to a probation and parole officer before the magistrate would give you any of these penalties. It is very important to make sure that you understand what you must do if you are given any of these penalties. Speak to your lawyer or the court staff if you are not sure what you need to do. If the Court decides that none of these options are appropriate, the Court may impose a full-time custodial sentence. In most cases if you are guilty of an offence, the magistrate will give you a penalty. Instead of giving you a penalty straightaway, the Magistrate may let you go to a program to help you fix problems that are getting you into trouble. These are called 'diversionary programs'. If you complete these programs the magistrate will take that into account when deciding what penalty to give you. They are not available in all courts so you will need to ask the court staff if there are any programs which may assist you. Only available in limited areas. Offenders who are facing gaol sentences and who have illicit drug problems may be able to apply. Offenders with drug problems may apply. If this program operates at your court the court staff will be able to give you a brochure explaining the program. This is a program you can attend at your own expense. It is designed to help you understand the responsibilities of drivers and the risks associated with dangerous driving. You may ask the court staff whether it is available near your court. Forum Sentencing is only available for certain offences and only at some courts. It involves having a meeting (the 'forum') between the offender, victim and various other people. At the meeting a plan will be developed to help reduce the damage done to the victim and to help stop the offender from committing more offences. The offender returns to court and the Magistrate decides whether to accept the plan and what else should happen. Circle Sentencing is similar to forum sentencing but is only available to Aboriginal and Torres Strait Islander people at some courts. Before you leave the Local Court, find out whether you have to sign any documents such as a good behaviour bond, community service order or periodic detention order and do this before you leave. If you are not happy about the Magistrate’s decision and you want to appeal, speak to your lawyer or ask the court staff about how to do this. Remember court staff cannot give you legal advice or tell you if they think your appeal will succeed. Court staff can give you information about procedures, forms, and fees payable (including about how to apply for fees to be waived). You can lodge the appeal form at court (or from gaol if you have received a gaol sentence). You must lodge your appeal within 28 days of the sentence date. In some circumstances this can be extended to three months with the permission of the District Court. Legal aid for appeals from the Local Court is not available in every case. A separate application for legal aid should be made. See the duty lawyer or contact your nearest Legal Aid office about this. Get a copy of the Legal Aid brochure Appealing to the District Court for more information. Is someone asking the court to make an AVO against you? Are you applying for Supreme Court Bail? Have You Breached your Parole? Are you Facing a Committal? Ask for these at court, your local Legal Aid NSW office, call 9219 5028 or Order online. The court officer organises the court lists and sorts out who has a lawyer and who doesn't. The court officer calls people into the court room and tells them where to sit or stand. The prosecutor represents the police in criminal matters. In serious cases, the prosecutor may be a lawyer from the Office of the Director of Public Prosecutions (ODPP). The Magistrate decides whether you are guilty or not guilty and what the penalty will be. In court, the Magistrate is called "Your Honour". The monitor records everything that is said in court. In most cases anyone can come into court, so you can bring your friends and family with you for support. Your Lawyer represents you at court. Acting on your instructions, your lawyer will enter a plea of guilty or not guilty, conduct your case at the hearing and tell the court about you if you are being sentenced. You (the defendant) can represent yourself or have a lawyer repressent you. Speak clearly and loudly. Listen carefully to everything and if you don't understand something, ask the Magistrate to explain it to you. If you have to give evidence about a matter in court, this is where you sit. Contact your nearest Legal Aid office (under L-Z in the telephone directory) or ring LawAccess NSW on 1300 888 529 or TTY 1300 889 529 (9am to 5pm Mon- Fri). LawAssist is a website designed to help people who are dealing with legal problems in New South Wales, without a lawyer. LawAssist provides helpful information on specific areas of law and the legal process. See www.lawassist.lawaccess.nsw.gov.au. The Law Society of NSW can refer you to private lawyers in your area. Ring (02) 9926 0300 or check their website. are located at a number of local courts to provide assistance and information. Contact your local court to find the location of an Aboriginal Specialist near you.